Keep your Leica SL at the cutting edge of the latest technical developments: This firmware update improves the performance of your Leica SL, bringing you numerous new features and enhanced camera handling. The firmware updates enable full compatibility with current and future L-Mount lenses from Leica as well as from our L-Mount Alliance partners. 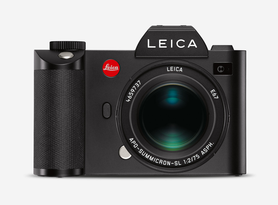 You can quickly and easily download Firmware Update 3.5 for the Leica SL. The instructions provided with the firmware update will guide you safely through the installation process. Easy Connect • New QR code for easy pairing of smartphone and camera. • Fixed WLAN name and password, no submenus for setting name and password. • No submenus for setting a connection mode, e.g. Create WLAN or Join WLAN. Compatibility with upcoming lenses from L-Mount Alliance partners • Body-lens communication standard extended for compatibility with upcoming L-Mount lenses. • Additional menu for updating the lens-firmware of upcoming lenses from L-Mount Alliance partners via SL camera body. • Compatibility with upcoming L-Mount lenses, that are equipped with an AF/MF switch on the lens barrel. In this case the lens switch is the master for AF/MF mode. • Compatibility with upcoming L-Mount lenses, that are equipped with an OIS mode switch on the lens barrel. In this case the lens switch is the master for OIS mode. Bugfix • In some cases the VARIO-ELMARIT-SL 24-90 f/2.8-4 ASPH. did show front focus issues. Lens Firmware 1.1 does solve this issue. Power Saving Mode • Changed functionality: While not using electronic Viewfinder or any operating elements, the camera will go into ‘Auto Power Off’ after a fixed amount of time. • Changed the timingfrom 3 to 10 seconds. • Option ‘Off’ no longer enables the camera to show Auto Review while shutter release is pressed. 35%. This allows to be quicker ready to continue shooting after a burst session. •	New firmware for the Vario-Elmarit-SL 24-90 f/2.8-4 ASPH. location which can be adjusted by the joystick. function in the "Customize Control" menu. allows to use Leica Image Shuttle and Adobe® Lightroom® Plugin without an inserted SD card. •	Enabling exposure compensation via top and rear dials in P, T and A mode. Improved handling when using Leica M and R lenses •	When using Leica M and R lenses, the new firmware 1.2 enables the activation of a loupe (magnifying) function with the auto exposure lock button (AE Lock) to allow fast manual focusing. •	The firmware update also guarantees the correct indication of the R-Adapter-M and the R-Lens used in the EXIF data of image files. The Leica Log Gamma curve (L-Log) for video has been improved •	In addition, the Leica Log Gamma curve (L-Log) for video has been improved to enable its use for in-camera 8-bit recording. •	The reduction of the offset now lets recordings appear considerably darker. Videos recorded with L-Log must be subsequently corrected with a gamma correction in an external video editing programme. •	The use of L-Log enables the greatest possible leeway for post-production colour grading of video recordings. *Leica performs ongoing compatibility tests of the latest cards available in the market. However, due to changes in production and software of the SD cards, Leica can not guarantee 100% compatibility of the recommended cards.